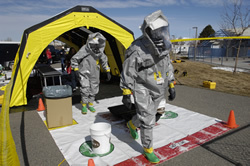 A hazardous material release is the contamination of the environment (i.e. air, water, soil) by any material that because of its quantity, concentration, or physical or chemical characteristics threatens human health, the environment, or property. An accidental or intentional release of materials could produce a health hazard to those in the immediate area, downwind, and/or downstream. A hazardous material release can come from a fixed facility or via its transportation through the area. The most likely locations for a transportation-related hazardous materials release are on Interstate 90, Highway 191, or the active railways. Interstate 90 crosses northern Gallatin County in an east-west direction. This Interstate is widely used by vehicles transporting hazardous materials. Highway 191, south of the Interstate, connects Interstate 90 to Yellowstone National Park and is used as a shipping route to the park and points south into Wyoming and Idaho. For the most part, the railroad parallels Interstate 90, except for where it goes through the City of Bozeman. Only the east-west railroad sections are currently active with an additional short section used south through Bozeman, and one north to Trident and south again to Willow Creek. The railroad is owned and operated by Montana Rail Link. If a transportation-related release occurred near populated areas or water supplies, serious human impacts could result. Historically, incidents have been small enough to prevent a large evacuation and long-term impacts however, hazardous materials incidents do occur in Gallatin County. Small Hazmat type calls occur regularly, usually involving a petroleum product such as diesel fuel or gasoline. The probability of a hazardous materials release can only be realistically assessed qualitatively. The history of events in Gallatin County is moderate with sporadic events over the past 20 years, none of which have resulted in a disaster declaration. The exposure, however, is high with Interstate 90 and an active railroad passing within close proximity to critical facilities and Bozeman. The probability of a significant release is considered greater along the railroad since the US Department of Transportation regulates hazardous materials on commercial vehicles, has specific regulations regarding mixed loads and amounts, and provides enforcement, whereas, the railroad system does not have as extensive control measures. 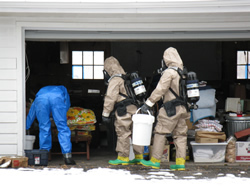 Therefore, the probability of a hazardous materials release that would require a significant government and public response is considered high. Lock doors, close windows, air vents and fireplace dampers to prevent outside air from getting in. Turn off fans, air conditioning and forced air heating systems to prevent exchange of outside air. Seal all windows, doors and air vents with 2-4 mil. thick plastic sheeting and duct tape to help seal the openings. Consider measuring and cutting the sheeting in advance to save time.